China has seen phenomenal growth in the last couple of decades to become the world's second largest economy. Today, it has the maximum number of billionaires after the United States. China and Hong Kong together are home to 115 billionaires. However, China's wealth has not been distributed uniformly among its citizens. According to Credit Suisse analysts, the rich-poor divide in China is at levels similar to Africa. One of the biggest drawbacks of the economic boom is the growing disparity between the 1.3 billion-urban and rural population. The government now plans to address the woes of the poor. With an aim to end poverty in the next 10 years, it has charted out a plan from 2011-20 to improve living conditions and raise the income levels of the poor. Image: A woman begs on a road in the embassies district of Beijing. China is set to achieve another five years of high growth although inflation threatens social stability and must be tamed, President Wen Jiabao said last week. Today, China's richest citizens hold hidden assets to the tune of $1.4 trillion. 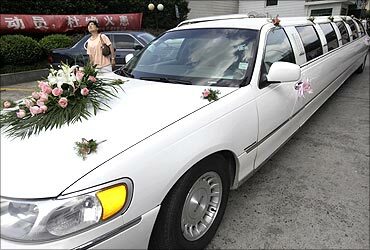 Yuan Ding Jin Sheng car rental service established in 2004, offers 20 limousine cars for rent primarily for weddings. Rental prices start from 7000 RMB ($1000) for five hours of rental use, according to the company. Image: A woman looks on near a Lincoln limousine ferrying a couple for their wedding in Shanghai. According to the World Bank, about 500 million Chinese still live on less than $2 per day. 61 million or 4.6 per cent of Chinese are considered below the national poverty line. 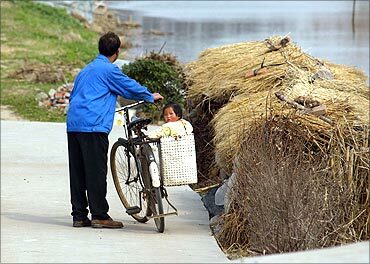 Image: A Chinese girl sits on her father's bicycle in a Shanghai suburb. China is now the world's second largest luxury goods market, with sales up 12 per cent in 2009 to $9.6 billion, accounting for 27.5 per cent of the global market, according to consultancy Bain & Co. 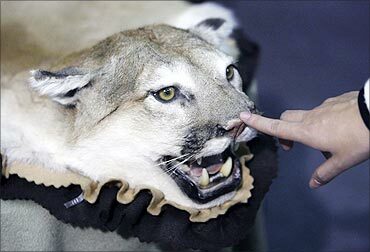 Image: A visitor touches a puma specimen of a private collection at the top essence luxury goods show. In China's State Council poverty alleviation plan, the country's poverty line of 1,196 yuan per year (about $0.5 a day) will be raised. 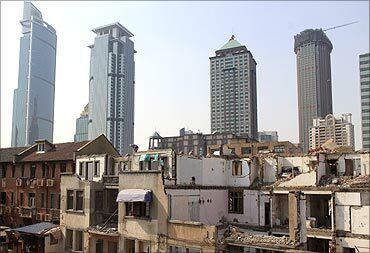 One of China's most glaring social problems - the growing gap between rich and poor - has the stability-obsessed government worried that if this gap keeps growing, it will fuel social unrest and violence in the world's most populous nation. Image: A beggar, using a board with wheels to get around, talks to a man while asking for money. 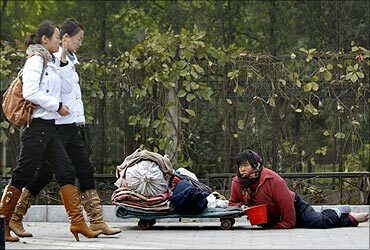 The average per-capita income for the richest 10 percent, at 97,000 yuan, was 65 times of that of the poorest 10 percent. The average age of China's wealthy is 39 years, roughly 15 years younger than their counterparts outside China and their wealth is growing more rapidly. 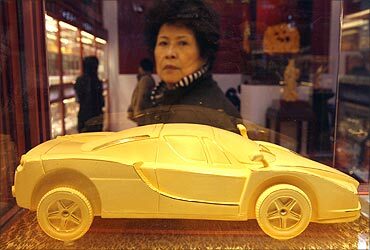 Image: A woman looks at a gold car on display at China International Jewellery Fair in Beijing. There are about 240 million migrant workers in China. The number is expected to reach 250 million by 2012 and reach 400 million by 2025. China's fast paced cities overburden workers and are known as 'factories without chimneys'. 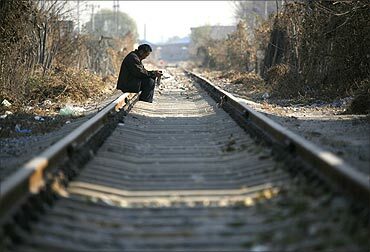 Image: A Chinese man sits on train tracks in a rundown area located on the outskirts of Beijing. By 2025, China's urban population is expected to be three times that of the US. China is also the world's largest car market and the biggest energy consumer. Round-the-clock construction is transforming muddy ground into what officials boast will be the world's largest financial zone, a monument to the ambitions that have driven China to dizzyingly fast growth. 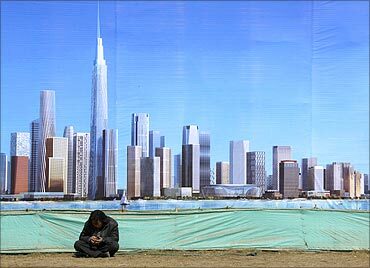 Image: A worker rests in front of an artist's impression of the new business district of Binhai. 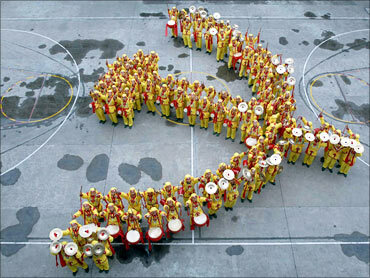 China has set its GDP target for 2011 at 8 percent, one percentage point lower than last year. The country aims to hold inflation at around 4 per cent in 2011. China's economic boom has resulted in stark social and health inequity amongst its population, and experts have urged the Chinese government to reform its medical and pension system in an effort to bridge the gap between the poor and rich. Image: A boy sits outside the front of a small shelter next to a pile of rubbish at a recycling centre. The wealthy Chinese now go for brand new jets. 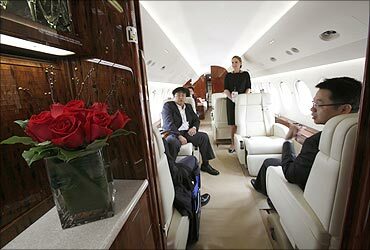 Billionaires in China own about 200 private planes. Image: Mainland Chinese visitors sit inside a Dassault Falcon 7X business jet. China's rural population will shrink from the current 900 million to 400 million in 30 years. 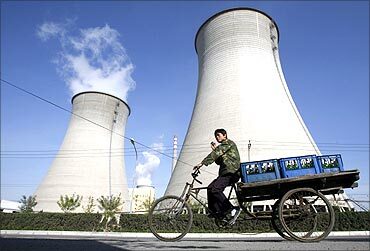 Image: A worker drives his tricycle in front of a power plant on the outskirts of Beijing. Fine wines is becoming the latest symbol of luxury among China's emerging class of newly rich. China does make its own wine, including brands like Great Wall and Dynasty, but it lacks the cachet and quality of a good French vintage, experts say. 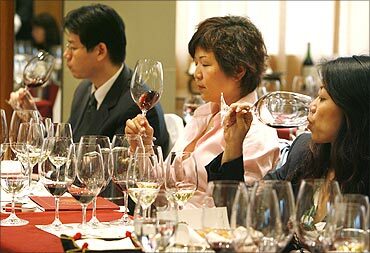 Image: Wine lovers try red wine during a Chateau Haut Brion wine-tasting event in Beijing. Poverty has affected several aspects like environment, health, education, housing, nutrition and agriculture in China. It has disturbed families and communities and forced millions from the poorer regions to the cities in search of work. 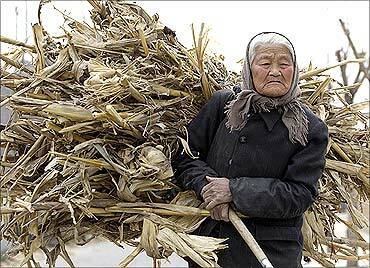 Image: A woman carries a load of firewood to her home in the village of Da Shi Men. The gross domestic product in China expanded 9.80 per cent in the fourth quarter of 2010 over the same quarter last year. 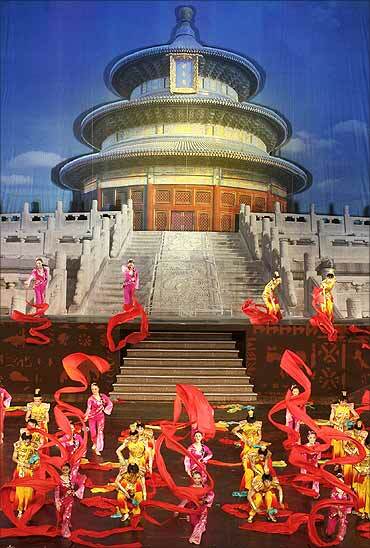 Image: Chinese dancers perform during a gala evening. A widening gap between rich and poor, widespread corruption, illegal land grabs and official abuses of power have fuelled a growing number of demonstrations and riots around China, often sparked by seemingly minor issues. 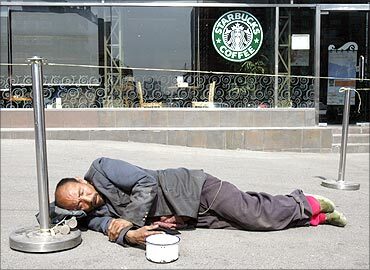 Image: A beggar sleeps in front of a coffee shop in Beijing. In China, wealth is being accumulated by the rich at a rate that is growing by 12.3 per cent a year, twice the global average. China's 30-year economic boom has transformed its coastal cities and brought a marked increase in the standard of living of urban residents. But China's rural households, especially in inland and western regions, have largely been left behind. 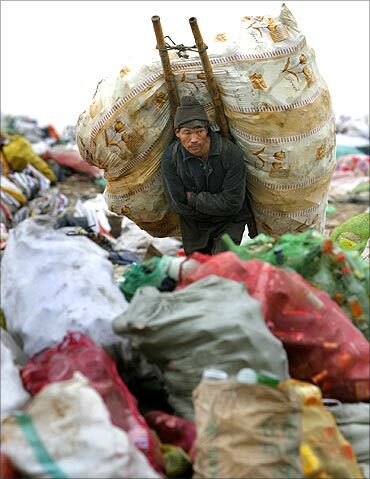 Image: A man carries a package on his back at a garbage dump site in Nanjing. From 1989 until 2010, China's average quarterly GDP growth was 9.31 per cent hitting a high of 14.20 per cent in December 1992. 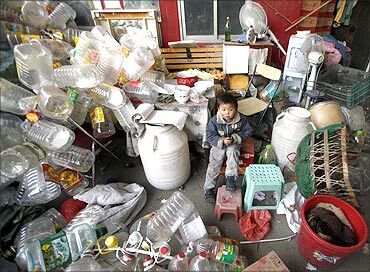 The average urban disposable household income in China is 32,154 yuan. Image: A migrant labourer works at a demolished residential site in downtown Shanghai. China's middle class population (those with annual income of at least $17,000) has now reached more than 100 million, while the number of super-rich individuals worth more than 10 million yuan ($1.5 million) is estimated to be 825,000, according to Hurun Report. 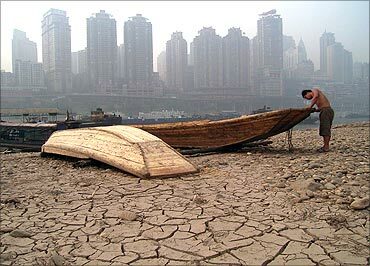 Image: A boatman repairs his boat on the dried-up riverbed of the Jialing River. China has become the world's fastest growing major economy, world's largest exporter and second largest importer of goods. It is the world's second largest economy by both nominal GDP and purchasing power parity. 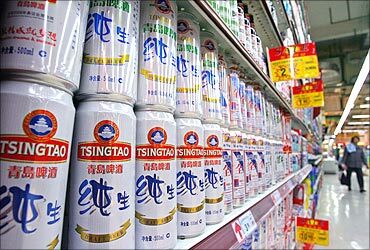 Image: A customer walks past Tsingtao beer cans at a supermarket in Nanjing. China's success has been attributed to being a low-cost producer. Cheap labour, good infrastructure, high productivity and a favourable government policy, an undervalued exchange rate has worked in its favour. China now ranks 29th in the Global Competitiveness Index. 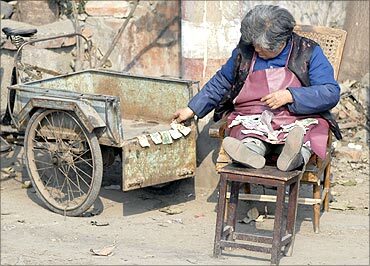 Image: An elderly woman counts small yuan notes on a street in Xiangfan, central China's province.